I first met Mary way back in 2004 when I was a stressed out art teacher and she was working as a therapist. My hazy memory recalls the amazing Indian head massages she used to do, lots of reflexology and the one off hypnotherapy session she did for me in preparation for an operation as my anxiety was hitting the roof. For my own selfish reasons I was a little disappointed to find out Mary no longer works in any of these areas as all her treatments were exceptional. Nevertheless, now I have seen her mosaic pieces, I see she had very good reason to take a new path and it is great to see another fantastic new artist on the block. The answers to my questions will give an insight as to how Mary’s change in direction has come about. Having had a tour around Mary’s studio, I can see she already has a plethora of work to display, not only her mosaics but her bags that she makes from vintage scarves. Her exhibition will be full of colour, quirkiness and interesting things to see. It will be well worth a visit to Orton Waterville. Hopefully, this will whet your appetite and encourage you to add Mary’s address to your list of studios to visit. Please refer to the PAOS website/brochure for details. JC: Why have you decided to join PAOS? MG: Well, that’s quite a long story. 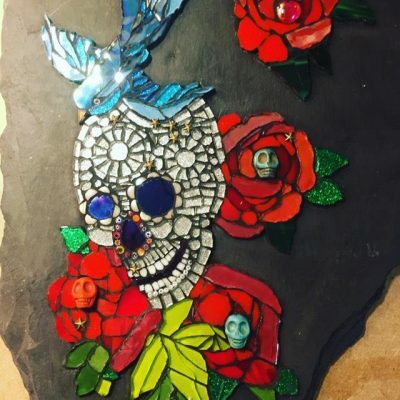 I did a one day Mosaic course at the Green Back Yard last year and I enjoyed it immensely, it was almost as if a switch had been flipped in my head and there was no turning back. I came home and starting creating bigger pieces and I haven’t stopped since. It was the same week as I had been given a cancer diagnosis, so it was a very poignant time for me. The lady who ran the course, Muni, who is a truly inspirational mosaic artist herself suggested that I join PAOS. I have visited open studios in the past so I know what it’s all about; it’s almost unbelievable to think that I am going to be part of it this year. JC: Why were you drawn to creating Mosaics in the first place? 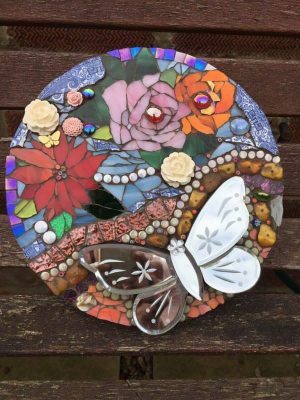 MG: I had an email informing me of the mosaic workshop and I thought straight away that it was something I wanted to try and something I could do. 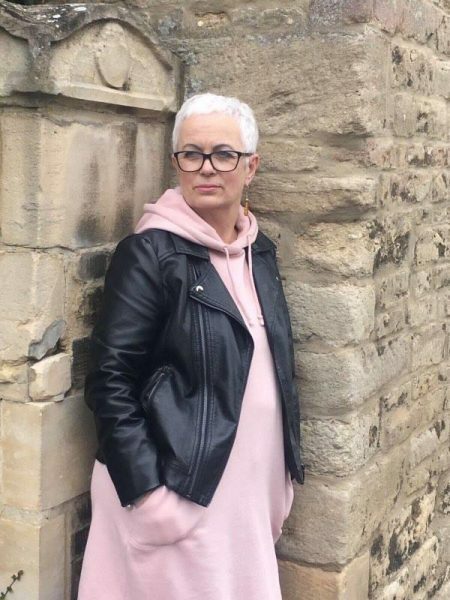 It was the same week I got my diagnosis and wasn’t sure if I wanted to go but the other option was to stay at home feeling sorry to myself, and I wasn’t going to do that, so that was that. Thankfully, I went, and met Muni and she introduced me to mosaics. 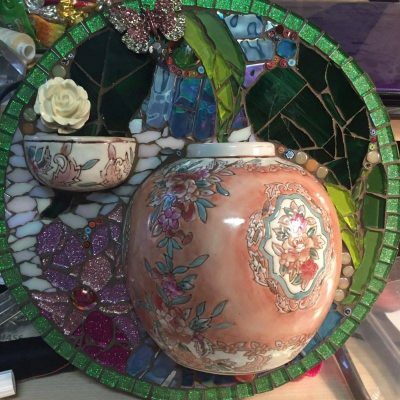 Creating mosaics has been my mindfulness, my meditation and my default setting through treatment and everything. The first mosaic I did was of a lion which was very tight and detailed. Since then I have loosened up and am having lots of fun experimenting with various ideas, techniques and materials. JC: You are obviously very artistic; did you go to art school? I did a three year exhibition and point of sale design course at a college in Hertfordshire. My first job was as a design assistant to the guy who did all the interiors for Steiner hair salons. It wasn’t for me, so I went into graphics in advertising agencies but felt a bit like a fish out of water. Eventually, I got into designing bridal headwear and found my niche. I created some really outrageous things; put them in a suitcase and one day traipsed off the Harrods’ bridal department to show them my designs. I was quite a cocky little thing in those days and somehow had the nerve to do it. Luckily enough the bridal buyer was in that day and was happy to have a look and she liked what she saw. She bought a range and that was my entry into the bridal wear business. I went on to sell at Liberty, Pronuptia and Berkertex, and retail outlets all over the world. I also won Conde Nast ‘Bridal Accessory Designer of the Year’ award. The fashion/bridal industry is tough and I had done enough so I decided to change my life and change career. I decided to train to be a therapist culminating in becoming a Clinical Hynotherapist which I did for some 25 years. JC: Will you be doing any demonstrations during the exhibition weekends? MG: Yes, I shall be sat here in my studio snipping. I won’t be doing actual demonstrations as such but I will be working. My daughter and husband are going to help me, so she can show people around if I am busy working my husband can make the tea. Hopefully the weather will be nice and we will have work out on display in the garden as well as indoors. JC: Where do you get your inspiration? MG: Just ‘life’ really, anything and everything that takes my fancy. My garden is a huge source of inspiration and as I work I am looking out onto it and can hear the birds singing. My wisteria plant has just recently bloomed and that is my current muse. I was asked to do a commission of a horse recently and was busy researching images of breeds of horse but wasn’t really feeling inspired. Eventually I decided to let rip and went for a multi-coloured mane inspired simply by looking outside at all the colours. It was very well received by my client and she, very kindly, is going to allow me to exhibit it during open studios. JC: Do you get to go to many exhibitions yourself? MG: No not recently to be honest. I am not a fan of London as I don’t like crowds but I did go to the Yarrow Gallery in Oundle where a lot of PAOS artists were exhibiting last year. It was interesting to see what everyone is up to. Some you like, some you don’t but that’s art isn’t it. JC: What if anything would you like to improve about your work? MG: Well, I think I am improving all the time. The way I see it, the more I do it the better it gets. Everything I do is an experiment really, so if it works I am moving forward. JC: What do you like most about your work? MG: I like the fact they are tactile, colourful, quirky and full of passion. People have said they see something different each time they return to them which is a quality I am very happy with. JC: Do you have a dream project? MG: Yes I am about the start it. I want to make a big round mirror and the theme is going to be ‘under the sea’. I have been collecting ‘treasure’ to put around it and can’t wait to get started on it. I am hoping to have it finished in time for the open studios. This is something I’ve been wanting to do for quite some time now. JC: Professionally what’s your goal?